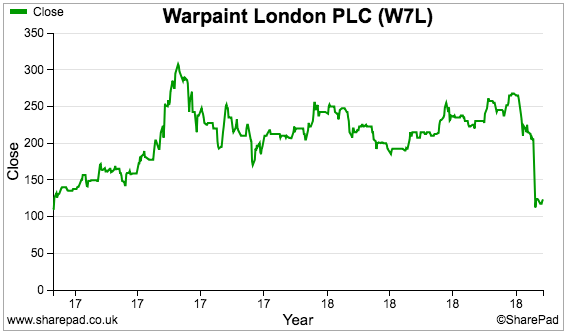 I am always looking for shares that can double, triple, quadruple or more during the years ahead. And one good way of finding such great investments is to study shares that have, well, already doubled, tripled, quadrupled or more. Take Fever-Tree (LSE: FEVR). This tonic-water specialist has rewarded savvy investors handsomely since the firm floated during 2014 at 134p. I don’t know about you, but I would love to capture just a fraction of such mega returns. What has made Fever-Tree so successful? Highlights include three-year average turnover and profit growth of 70%-plus, an EBIT (or operating) margin of 33%, and a return on equity of 42%. 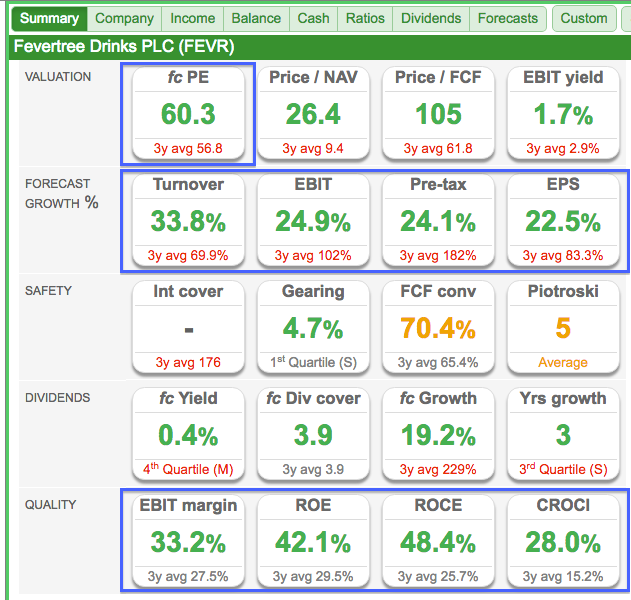 Such magnificent stats alongside current-year predictions of 20%-plus growth explains Fever-Tree’s stratospheric P/E. True, you can employ SharePad to trawl for other companies that exhibit similarly wonderful numbers. 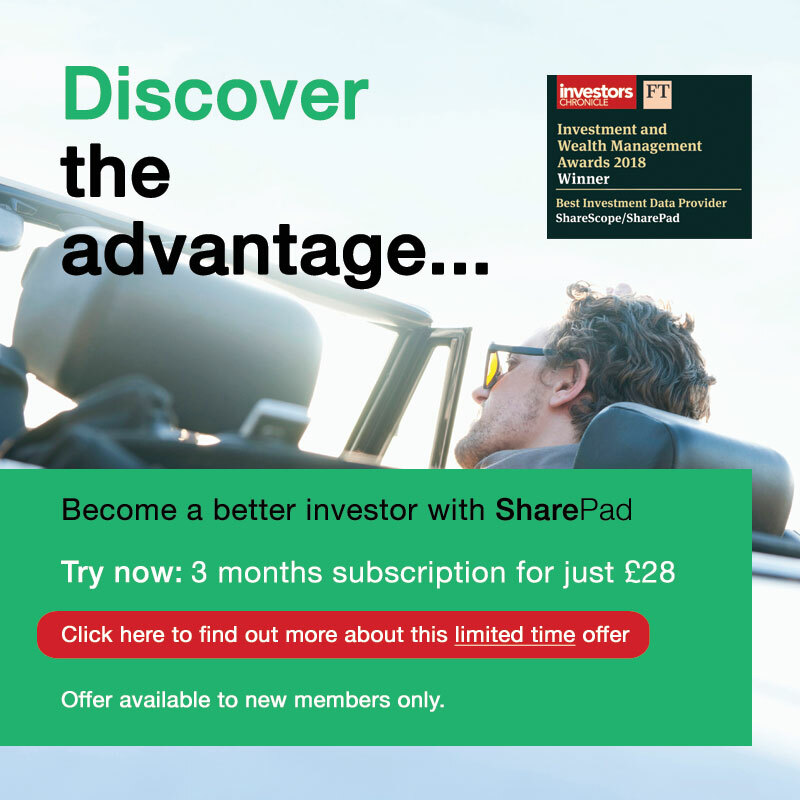 However, you can also employ SharePad to delve a little deeper into the likes of Fever-Tree, and understand a little more about what makes such businesses so successful. 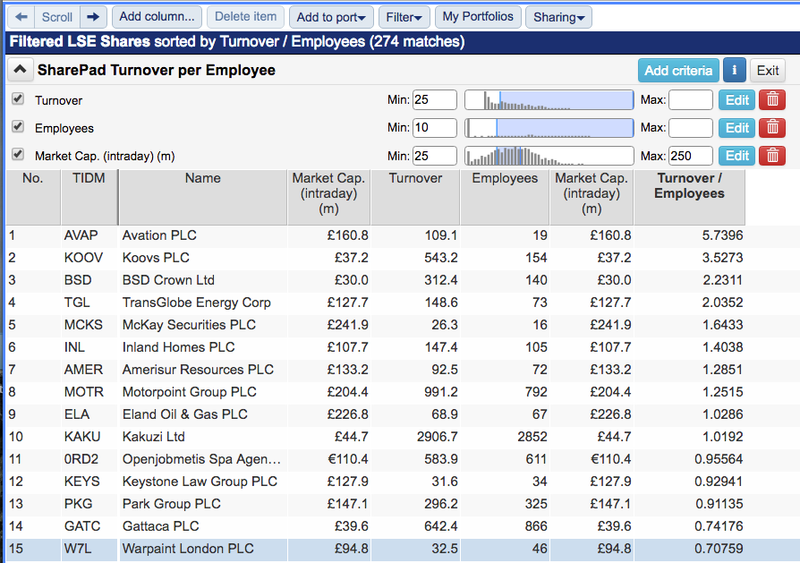 One of my favourite ways of assessing companies is by calculating their turnover per employee. The theory is simple: companies that produce high sales from few people are often simpler to manage and grow than businesses that produce low sales from many people. In fact, if you can find a business that can expand significantly without needing to take on huge numbers of extra staff, then perhaps you have found a business with a product that actually sells itself. Suffice to say, companies blessed with products that sell themselves are generally good for us investors! 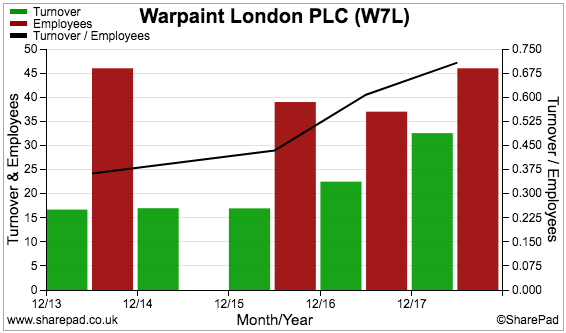 The green bars represent Fever-Tree’s sales, and the red bars represent Fever-Tree’s number of employees. 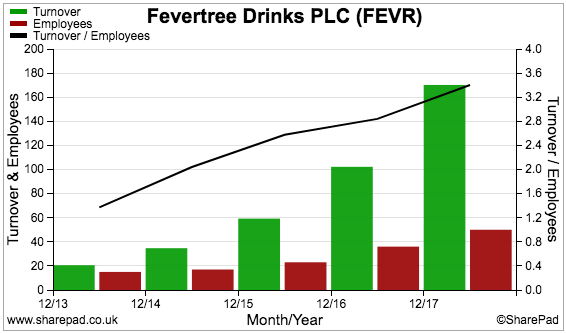 The black line shows Fever-Tree’s sales per employee. 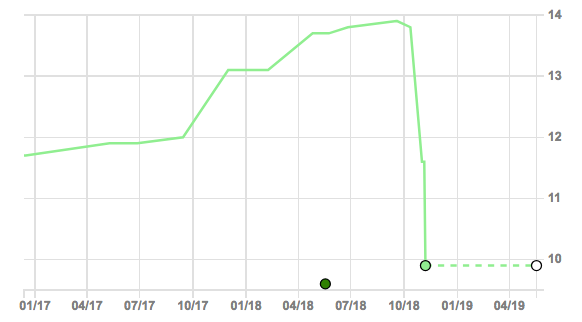 The chart above is actually one of the most beautiful I have ever produced within SharePad. …and a vast army of new recruits — plus all the additional overheads such recruits come with — have just not been needed to get the firm’s mixers into many more drinks. Instead, Fever-Tree has outsourced people-intensive activities such as manufacturing and logistics — and concentrated mostly on marketing — with the result being an average sales per employee at an astonishing £3m-plus. Is selling cosmetics similar to selling tonic water? Let’s now use SharePad to unearth an interesting business with high sales per employee. For this trawl I have set a minimum sales level of £25m and a minimum employee number of 10. That way I remove a lot of niche property groups and obscure mining firms from my search. My screening also looks for market caps of between £25m and £250m, with the hope I will find smaller companies that still have a long way to grow. 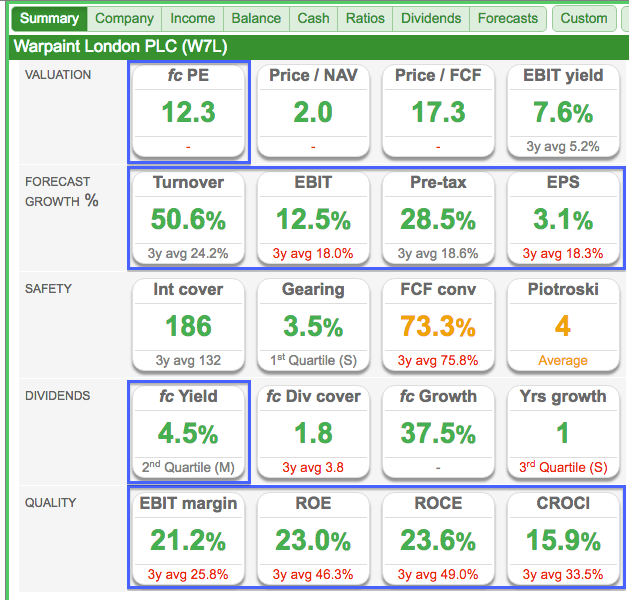 Warpaint London (LSE: W7L) stood out among the first 15 names. So, sentiment towards the company should be low… and that may present us with a bargain. Furthermore, selling cosmetics might be very similar to selling tonic water — the product could also enjoy super margins due to a perceived branding quality. Has the 45% share-price crash left us with a high-quality bargain? Warpaint started selling excess and clearance cosmetics to high street retailers back in the early 1990s. 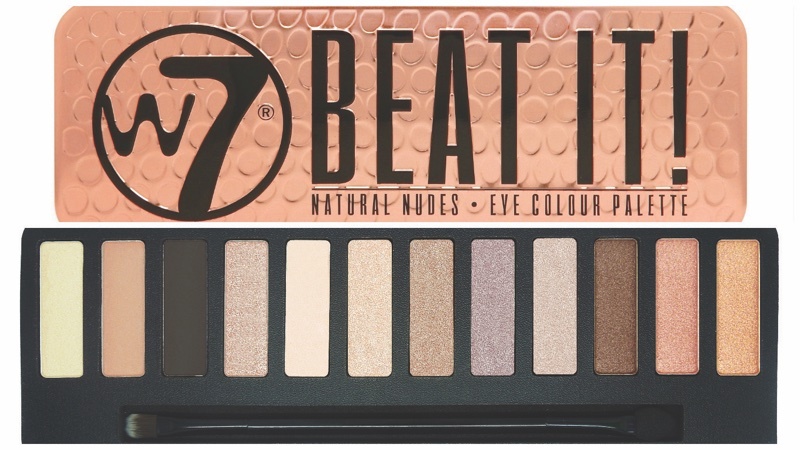 The firm introduced its own W7 cosmetic range during 2002 and today some 61% of revenue relates to this flagship brand. Face make-up, eye shadow and lipsticks represent the bulk of sales, with more than half of all products now sold overseas. A strategy of selling “high quality products at an affordable price” — alongside the help of celebrity endorsements and beauty bloggers — have delivered some useful accounts. We can see sales per employee (the black line) improving steadily over time to £700k for 2017. While not exactly in the Fever-Tree stratosphere, sales of £700k per employee are still very impressive. In fact, almost two-thirds of those 274 companies from my earlier search produce less than £200k per employee. 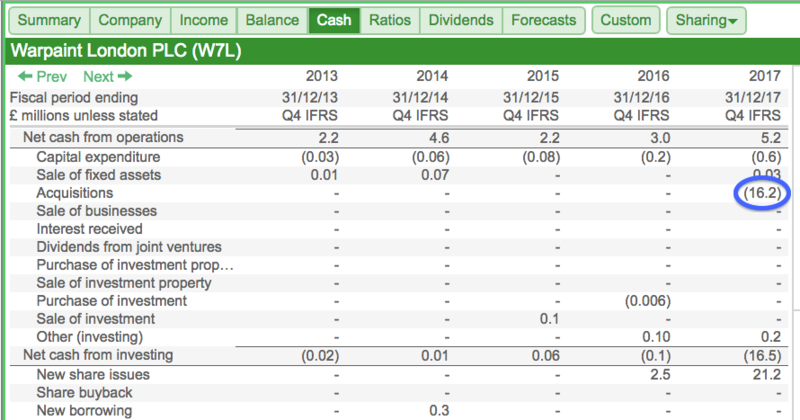 Certainly, the second row — with the prospect of sales growing by 51% and pre-tax profit by 29% — looks very enticing. Then the bottom row — showcasing a 21% EBIT (or operating) margin and a 23% return on equity — is very encouraging, too. Combine all of them with a reported 12.3 forecast P/E (top row) and a forecast 4.5% dividend yield (fourth row) and I am left wondering whether the aforementioned 45% share-price crash has left us with a high-quality bargain. But hold on… that earlier SharePad summary tab showed sales and pre-tax profit were still expected to grow significantly. Sales and pre-tax profit were £32.6m and £6.9m respectively last year, and the trading statement said sales and pre-tax profit could be at least £48m and £8.5m respectively for 2018. Therefore, the business is still expected to grow. I need to delve deeper. 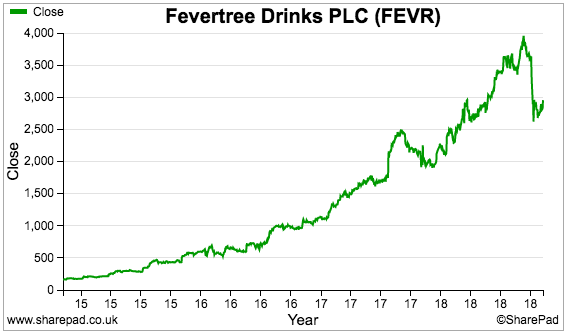 Why did the share price crash 45% when decent sales and profit advances are still anticipated? A rule of thumb I have with my own stock-picking is to always be wary of companies that spend all of their annual profit (or more) to buy other firms. You see, my experience tells me shareholders often face trouble from large acquisitions. For example, such deals may signal the core business has run out of steam and/or the directors have run out of ideas. Large purchases also run the risk of hefty sums being wasted should the company acquired turn out to be poor. Integration difficulties may arise, and the expected operational benefits may not appear, too. 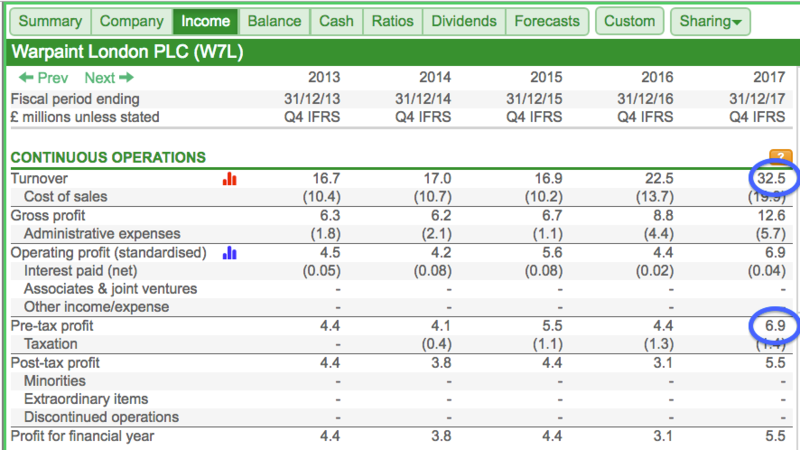 Anyway, Warpaint spent £16.2m on an acquisition last year when the firm’s operating profit was £6.9m. The deal was therefore very significant. Time now to dig into the 2017 annual report to discover more. I now understand what has happened. Had the purchase been made at the start of 2017, additional revenue of £18.9m would have been generated — and total sales would therefore have been £32.6m plus £18.9m, or £51.5m. All of a sudden, expecting sales of approximately £50m this year has become not such a big deal. In fact, ‘underlying’ revenue looks like stagnating at best for 2018. You could say the same for ‘underlying’ profit, too. Now those brokers are forecasting less than 10p per share. No wonder the share price suffered a massive P/E de-rating. The flagship W7 brand would appear to have lost UK sales even without the Felixstowe problems. I have to say, that is worrying. I guess such hashtags may now take the shine off Ms Buckland’s social-media posts about Warpaint’s W7 range. I don’t know whether the ASA and the floundering UK sales are connected. But I reckon the ASA’s intervention won’t have helped Warpaint’s “key strategic priority” for marketing. I am not sure if the acquired customers that are of “an older age range” and/or are male are as likely to be as influenced by social media as Warpaint’s younger, female customers. Further SharePad checks show Warpaint may have the wherewithal to revitalise its struggling UK sales. I would like to think their combined £45m shareholding will provide some incentive to get the business back on track. Indeed, both men started selling cosmetics as teenagers at street markets around 40 years ago. I bet the pair have recovered from many setbacks before. As such, the weaker UK trading should not lead to Warpaint needing emergency money from banks or shareholders. Oh dear. This article has not turned out quite as I had planned. I had thought my screening would lead to discovering a higher-quality small-cap with products that sold themselves. True, Warpaint exhibits some appealing financial ratios and management’s long experience is also a plus. However, I am really put off by the large acquisition combined with the flagging UK sales of the firm’s core brand. Indeed, I do wonder whether the acquisition was a desperate move prompted by earlier signs of difficult UK trading. Oh well, never mind. This sort of thing frequently happens with my stock-screening. 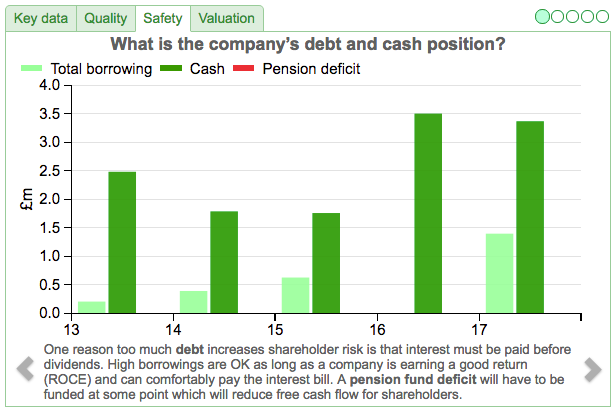 I find an interesting share, only for SharePad to reveal all of the downsides. At least there are another 273 shares from my search to study! Half of all Warpaint’s employees work in a warehouse, and only a small number work in sales. In contrast, that snapshot I showed you earlier from Fever-Tree’s annual report revealed half of its staff working in sales. Perhaps Warpaint should consider re-balancing its workforce to revive its UK revenue. Disclosure: Maynard does not own shares in Warpaint London.